The list of the many honors bestowed upon Ignacy Jan Paderewski (1860-1941) by an international array of governments, institutions, and private individuals, includes several honorary doctorates. According to Adam Zamoyski’s biography of the composer (1982) Paderewski received honorary degrees from the following institutions: University of Lwów (based in Austrian Poland, now Ukraine; 1912), Yale University (1917), Jagiellonian University in Kraków (1919), Oxford University (1920), Columbia University (1922), University of Southern California (1923), Adam Mickiewicz University in Poznań (1924), Glasgow University (1925), Cambridge University (1926), and SUNY, New York (1933). In addition, the composer-statesman was asked to become the Lord Rector of Glasgow University (1934), but declined the offer. In Polish sources the doctorate received from the University of Southern California has been listed as awarded by the University of California in Los Angeles (or “Los Angeles, Uniwersytet Kalifornijski”), for instance by Małgorzata Perkowska in her Diariusz Koncertowy Paderewskiego of 1990. While the correct information about this degree has been published in some English-language biographies of Paderewski as well as the recent entry in the New Grove Dictionary of Music and Musicians, similar errors, confusing the private University of Southern California with the state-wide, public University of California system and its Los Angeles division (Irvine, Riverside, San Diego are other locations of the University of California branches), have been common in Poland. Figure 1: Paderewski and Von KleinSmid at USC. Los Angeles: El Rodeo (USC Yearbook), 1923. Courtesy of USC University Archives. The USC documents, here published for the first time, include photos from the USC Yearbook of 1923 and press clippings from several newspapers from the Los Angeles area. Three press reports are reproduced below: from the Los Angeles Times (at present the most serious and respected newspaper in Southern California, founded in 1881), the Los Angeles Examiner, and the USC student paper, issued daily during the academic year on USC campus, The Southern California Trojan (today the Daily Trojan). The name of the latter publication refers to USC mascot, “Tommy Trojan” whose sculpture adorns the main square on campus; USC athletic groups bear the name of “Trojans” and the whole USC community is often referred to as “The Trojan Family.” This naming reflects the significance of ancient Greek culture and its various aspects taken to a symbolic level in the early years of American academic life. A preoccupation with all things “Greek” is noticeable, for instance, in the writings of Dr. John H. Finley, a scholar, poet, and editor of the New York Times (see “Paderewski in Poetry” and Part II of “Paderewski and the Tenth Anniversary of Poland’s Independence” in the current issue of the Journal). The reports include endnotes added by the editors; the originals – published in daily papers – did not bear such annotations and their authors did not provide detailed explanations about the identity of persons or institutions mentioned, for instance about the singers or the members of the Native Sons of the Golden West. The patriotic character of this “international” event was underscored by the gift of American and Californian flags from the Native Sons, and by the closing of the ceremonies with singing America, the Beautiful. The song with text by poet Katharine Lee Bates (1859-1929) and melody borrowed from a pre-existing song, Materna, by Samuel Ward (1847-1903), was the most serious competitor of the Star Spangled Banner for the honor of American national anthem. The Congress solved the issue only in 1931 selecting the latter. However, the context of the song’s presentation in 1923 at USC suggests that it still fulfilled the function of the national anthem. America, the Beautiful was probably sung by Alice Gentle, one of the two singers presented at the ceremony. The international character of the honorary doctorate proceedings was underscored by the participation of a Japanese soprano, Tamakia Miura, who sang a selection of English and Japanese arias and songs. Ignace Jan Paderewski, Polish patriot and statesman and world famous pianist, was awarded the degree Doctor of Laws yesterday morning by Dr. Rufus B. von KleinSmid, president of the University of Southern California, in the presence of a large assemblage of students and faculty members gathered in Bovard Auditorium. This signal honor was conferred upon Paderewski by the University in recognition of his immortal art as a composer and musician and as a statesman who piloted his native country through the most perilous period in its existence. The huge auditorium was filled to capacity and many lined the walls in their attempt to get a glimpse of the famous musician. 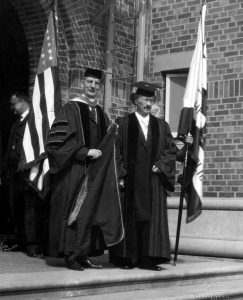 Faculty members clad in robes assembled at the Old College Building on the campus and headed by the university band, fifteen members clad in white flannels and sweaters, Dr. von KleinSmid and Mr. Paderewski, marched to the Bovard Auditorium where ceremonies were held. An elaborate musical program preceded the conferring of the degree. In honoring Mr. Paderewski, Dr. von KleinSmid said that the Polish statesman’s devotion to his art in all its manifestations and his unselfish and tireless allegiance to his country coincident with its birth as a nation, entitled him to the degree. “I am overwhelmed by the solemnity of this ceremony, by its beauty and its import in conferring upon me the highest honor that is possible for you to confer,” Paderewski said in accepting the scarf, emblematic of the degree Doctor of Laws. “I am not a university man, for privileges and enjoyments of a college education were denied me when young. The foundation for all that I now Know outside of music has been established through persistent efforts by private lessons in the early part of my life. Even then I had to teach in the daytime in order to be taught at night. For many years I was forced to teach from nine to eleven hours of music, so the little knowledge that I possess has been obtained at a high cost. John Sobieski, a countryman of Paderewski who came to this country sixty-eight years ago yesterday and who now lives in Los Angeles, also was presented on the program. Madame Tamakia Miura, Japanese prima donna with the San Carlos Opera Company, and Miss Alice Gentle furnished music for the program. Madame Miura’s selections included Chanson des Cigales, Karuka Kurukato (Expecting Sweetheart) Samurai and Dille tu Rosa, two Japanese selections dedicated to Madame Miura. Two flags, one of the State and one of the country, were presented to the University by Charles L. McEnerney, grand director of the Native Sons of the Golden West, and were accepted on behalf of the institution by Dr. von KleinSmid. Among the trustees of the University who were present were President Emeritus George Finley Bovard, George I. Cochran, Arthur Chapman, Judge William M. Bowen, Dr. W.W. Beckett, J. B. Green, R. E. Gronmiller, and A. M. Chaffee. Jan Ignace Paderewski [sic], famous Polish statesman and musician, was honored by the University of Southern California yesterday morning when he received the degree of doctor of law. The degree was conferred in recognition of distinguished services rendered by the musician to his native country and in recognition of his achievements in the world of music. Although the degree was awarded last June, the conferring was delayed until yesterday since this is the first visit of the famous musician to Los Angeles since that time. Dr. R. B. von KleinSmid, president of the University, presided and conferred the degree. The exercises, which included the observance of Washington’s Birthday, opened with a procession in which the faculty, graduate students and seniors took part. The assemblage sang Alma Mater and Dr. R. D. Hunt, dean of the graduate school, introduced Hilliard E. Welch of Lodi, grand trustee of the Native Sons of the Golden West, who presented the University with processional flags in behalf of the order. In addition to the Stars and Stripes, a California State flag was presented. Report in the Southern California Trojan (22 February, 1923). Ignace Jan Paderewski, upon whom the University of Southern California is to confer the honorary degree of Doctor of Laws this morning is an exception to the general belief that a genius might be a genius in only one endeavor. Although Paderewski directs his art and the ability at only one thing at a time, he accomplishes successfully everything he undertakes. His carrier as a pianist and composer is known to every man, woman, and child the length and breath of civilized world. Not since Paganini has there stood forth among the virtuosi, such an individuality as Paderewski. And the West is indeed delighted to hear his personal manager, Mr. Fitzgerald, says that the pianist’s long respite from public appearances has put a new fervor into his playing and interpretations. During the war, however, a new Paderewski was discovered and placed in a new role—that of Poland’s able pilot of her Ship of State. As first premier of the little republic and around the council tables at Versailles, he fought his country’s battles and brought her through the war with a new-born hope for her progress. Conversing or merely watching Paderewski, one remembers, too, that a genius may yet have a personality, may yet be a man. The pianist-statesman talks quietly, but with decision, and in a musical, natural tone of voice. His eyes are alive and bright, indicating mental keenness, his hair is slightly gray, and his face is little drawn from his experiences the last few years. His step is light and quick. When visiting Paso Robles and his two almond ranches near there he often attends the movies and displays exceeding interest in them—laughing with the children and applauding with the adults. Naturally, Paderewski values and cares for, to a great extent, his marvelous fingers. It is even said that, in tramping over the hills around Paso Robles with Mme. Paderewski, the artist is forced to allow the manager of his ranch to help his wife over the rough places for fear of injuring or straining those fingers. Paderewski’s name, by the way, is not pronounced as if it were spelled “Paderooski,” but rather as though it were “Paderefski.” Many are ignorant of this fact, however. The exercises this morning will be opened by an academic procession, led by the S.C. Band, marching from the old college to the administration building. Dr R. D. Hunt will introduce Hillard Welch, Grand trustee of the Native Sons of the Golden West, who will present the flags of the United States and the State of California to the University. President von Klein Smid will then present the degree to Paderewski in behalf of the University. Figure 2: Press Report from The Southern California Trojan. Courtesy of USC University Archives, Los Angeles. Report in The Southern California Trojan (23 February, 1923). Surging through the doors, occupying every available seat, and even overflowing into the corridors, throngs crowded Bovard auditorium yesterday morning to witness the conferring of the honorary degree of Doctor of Law upon Ignace Jan Pederewski. For the second time in its history the University of Southern California was host to an artist of world wide repute. Although the occasion was in the nature of Washington’s birthday celebration, the affair took on an international note in view of the great maestro’s service as ex-premier and president of the Polish republic. Other guests of the day were John Sobiesco, son of the last king of Poland, Madame Tamakai Miura, Japanese prima donna of “Madame Butterfly”; Miss Alice Gentle, L. E. Behymer, impresario, and Charles MacEnerey, Grand Trustee of the Native Sons of the Golden West. The degree of Doctor of Laws was bestowed upon Paderewski by the University in recognition of his great service as statesman and musician. It was awarded him last June by the trustees and president of the University, but was not conferred upon him in person because of his inability to be in Los Angeles at that time. Following the bestowal of the degree, there was a thunder of applause lasting fully three minutes. At one time during his speech, Paderewski provoked laughter by expressing the hope that the audience could understand him better than he could himself. Earlier in the program, Charles MacEnerney, of San Francisko [sic! ], Grand Trustee of the Native Sons of the Golden West, made formal presentation of the flags of the United States and the state of California to the University. For purple mountain majesties / Above the fruited plain! And crown thy good with brotherhood / From sea to shining sea! A thoroughfare for freedom beat / Across the wilderness!